The southeastern Pa Synod Assembly was held in Franconia, PA May 6 & 7. Pictured from left to right – Dave Ehret, Pr. 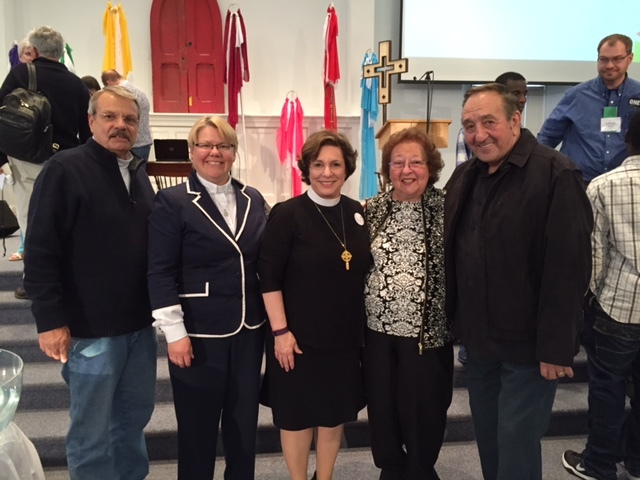 Leslie Richard, SEPA Bishop Claire Burket, Jan Carrara and Fred Carrara. Dave Ehret was elected to the synod council for a 3 year term. May 2016 – Buy a Concrete Block! Our sidewalk on the Mather Avenue side of our church needs some replacement of several blocks. If you would like to “buy a block” at $225 each please let the church office know. This will help defray to cost of the work that needs to be done so you don’t have anyone injuring themselves on the broken sidewalk. Sundays in May – 5/1, 8, 15, 22, 29 – Choir rehearsal will take place every Sunday immediately following the worship service. Please let John know if you are able to attend or not prior to each Sunday. Friday & Saturday, May 6th & 7th 2016 – Synod Assembly will be attended by Dave Ehret & Pastor Richard on Friday and Jan & Fred Carrara & Pastor Richard on Saturday. Sunday, May 8, 2016 – There will be a Council Meeting immediately following the worship service in the downstairs meeting room. Please plan to attend. May 8th is Mother’s Day! Wednesday, May 11, 2016 – we will be feeding the homeless. If you are able please come around 9:30 in the morning to help prepare the food and/or come at 6:15 p.m. to help deliver and feed the hungry. Also on May 11th there will be a Bible Study lead by Pastor Richard will begin at 11:30. We will be studying the book of Acts. Please feel free to bring a brown bag lunch and a friend. We will meet in the downstairs meeting room. Sunday, May 15, 2016 – Michael P. Ghelardi, FIC, Financial Associate with Thrivent Financial® will be here to do a Legacy session for us with brochures and refreshments. Monday & Tuesday, May 16th & 17th 2016 – Last Days of Nursery School. Wednesday, May 18, 2016 – Nursery School Closing program at 7:00 p.m. for the four year old class. Thursday, May 19, 2016 – Nursery School Closing program at 6:30 p.m. for the three year old class. 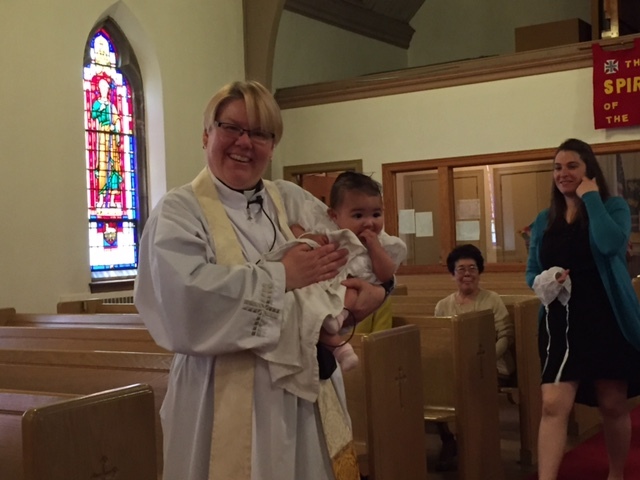 Sunday, May 22, 2106 – Pentecost and Ella Sommer, daughter of Yoshi and Andrea Sommer will be baptized. Sunday, May 29, 2016 – Holy Trinity Sunday and Pastor Richard will be on vacation Sunday, May 29th and our guest pastor will be The Rev. Paul Jann. Its spring cleaning time and we will be having tables for rent for our Annual Bazaar this fall. We will be renting tables at $25.00 each. If you have a few attic, basement, garage or closet treasures you would like to donate we will have 2 or 3 tables that will profit Grace. If you have more than a few you can rent a table for $25.00 so you can sell your treasures and make some extra cash for yourself or share a table with a friend. We encourage you to ask friends and other family members to see if they are interested in renting a table. We will also be renting tables to the public so if you are interested in renting a table please contact the church office so we can reserve a table for you. We will be having our lunch items – hot dogs, chili, soup, soda, water, etc. and we will be selling jars of homemade soup and homemade baked goods. The date of the bazaar is Saturday, October 22nd and time is 9:00 a.m. to 2:00 p.m. We need your help with making soup and baked goods to sell plus set-up and breakdown and clean up as well as kitchen help and soup and baked goods selling. As we get closer we will have a sign-up sheet.